Get ready to start fielding voice calls in Slack. The company announced Tuesday that all users of its popular chat app will be able to ring their teammates with a couple of clicks. People who access Slack on a Mac or Windows PC using either Google Chrome or the communication service’s own app will see a phone icon in the header. Users can click that button and start a voice-only call without making other participants open up a second app. This phone glyph in the header of a Slack window lets users place a call to one of their teammates. The feature launched in beta earlier this year. It marks an important move for Slack as it competes with established players in the work communication market, including Skype for Business and Google Hangouts. People who are paying for Slack will be able to host calls for as many as 15 people in any channel or direct message, meaning users will be able to host conference calls without wrangling dial-in information. Free users will only be able to call one other person on their team at a time. 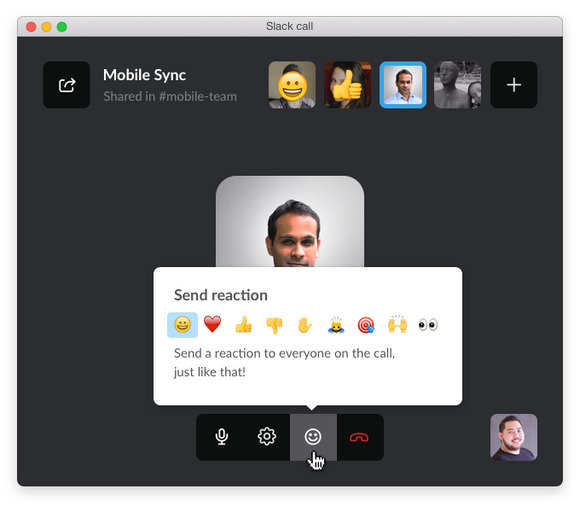 There’s a little bit of extra Slack flair to these calls: Users can respond with a small set of emoji reactions while someone else is talking. Those reactions, taken from the set used in Slack text messaging, add a lighthearted touch to the conversation and can also save on cross talk from people chiming in. Slack says there’s still more coming for the calling feature. The company is beta testing the ability to make and receive voice calls through its Android and iOS apps, something it says will be coming to everyone later this year. Slack also has video calling and screen-sharing on its roadmap, though it hasn’t said exactly when they’ll be available.